Would you like to set free your creativity? I absolutely love to paint and nothing gives me greater joy than passing on this ability to others. 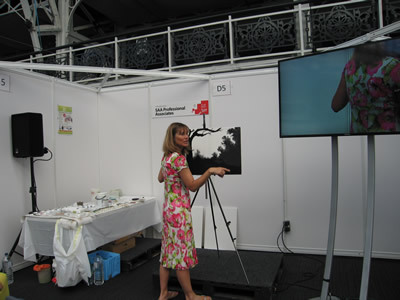 Learn to paint in a day…. yes, it is possible and no painting experience is required. 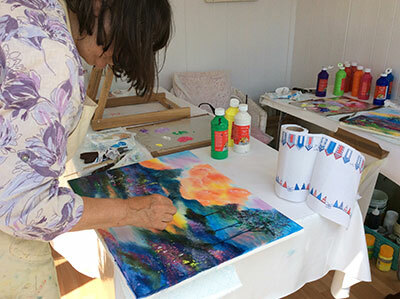 I predominantly use wet-on-wet oils when teaching as it is such an easy medium to use, but I also teach acrylics as well as using inks, moulding pastes and gessos into the mix at times too to add textures, depths and colour. I would say 65% of art students who come for lessons have never painted or picked up a brush. 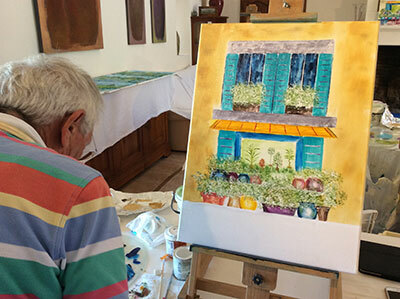 We go through the whole day step-by-step completing a landscape/flower scene by the end of it, leaving plenty of space for you to develop your own ideas as you wish. Of course, I also teach those who have more experience and wish to develop their skills. The tuition is fun, informal and supportive. Although we travel through the process one step at a time, there is the opportunity to paint whatever one wishes. It is simply a starting point for people to develop their own style and come up with alternative ideas. There are plenty of classes and workshops available ranging from a day to two and a half hours. What is the difference between the two? The size of canvas, the detail accomplished and the price. These start at 10am and finish approx 4pm, inclusive of breaks and lunch. You will complete a scene within that time on a good sized canvas (24” x 18”). Pricing includes all materials; paints, brushes, canvas, easel and apron. These are 2½ hour sessions inclusive of a break. Again, you will complete a scene within that time on a smaller canvas. All materials are supplied as above. If you would like to hone your skills and take up classes, there is the option to pay up front for 5 sessions and the 6th session is free.This is applicable to all the workshops available, whether it be a day or morning/afternoon, individual tuition or group. 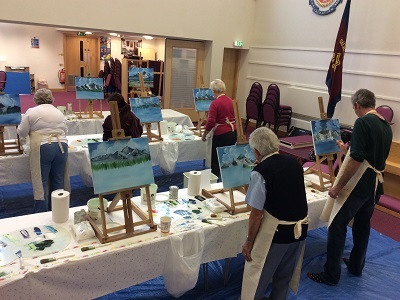 We will go on a journey painting a variety of landscapes and floral scenes. 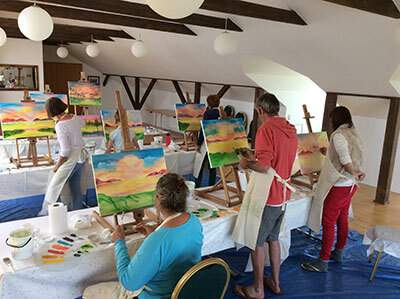 Sometimes the best way to start is on a one-to-one basis, where you will receive full attention in a comfortable environment aimed at building your confidence, or maybe you would like to master a particular aspect of painting, such as clouds or bushes and improve your own technique. Whatever the reason, I will make sure that the tuition meets your aims and requirements. Working in a group can be a lot of fun as everyone soon realises they are in the same boat. The support and rapport with others can be invaluable. Groups are kept small to ensure individual attention. I am available for demonstrations ranging from 30minutes to several hours and have demonstrated to a wide range of groups and organisations. These have included Women’s Institutes, Farmers’ Wives Organisations and Art Groups. Demonstrations have ranged from 8 participants in a local group to hundreds in London events. 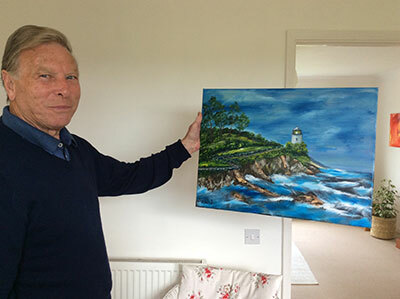 I have found that once people have seen a demonstration and the ease with which a painting can be produced, they too become keen to give it a go. For demonstrations, please contact me to discuss further.